A 38-year-old female presented with moderate to severe intensity central abdominal pain radiating to back for 2 years. She was diagnosed with chronic pancreatitis with intracanalar stones 10 years previously. She underwent lateral pancreaticojejunostomy (LPJ) 8 years ago after failed pancreatic endotherapy (ERCP). CT was suggestive of post LPJ status, diffusely atrophic pancreas, dilated pancreatic duct (PD) in head (1.5 cms), and 2 calculi measuring 1.4 and 1.6cms in the head region. ERCP and wide pancreatic sphincterotomy was performed. 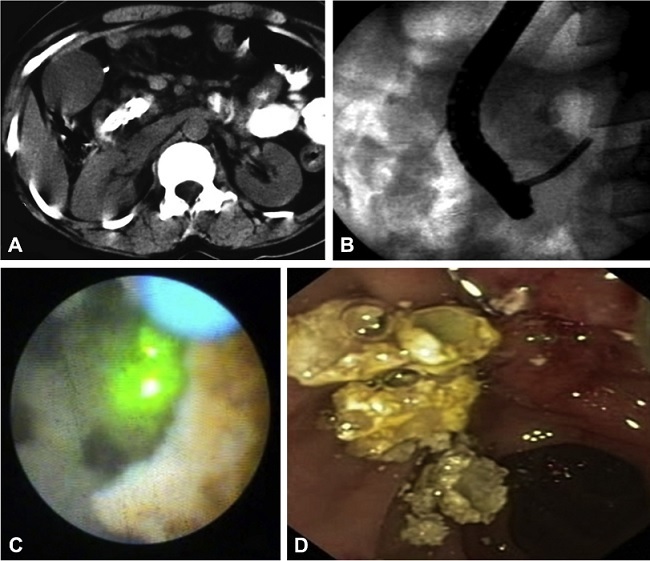 In view of the large size of the stones, balloon extraction of the stones was not feasible and the decision was made to attempt pancreatoscopy guided laser lithotripsy (LL) and pulverize the stones prior to endoscopic extraction. Pancreatoscope (Spyglass, Boston Scientific, USA) preloaded with holmium laser fiber was passed in the PD. Holmium laser was (Medilas H20; Dornier Medtech, Germany) delivered via a 365-µm diameter fiber with energy levels set at 800-1500mJ at a frequency of 8 to 15 Hz. Intermittent perfusion of the duct with 0.9% normal saline solution was performed with flow rates that averages 220 to 300 mL/min to permit intra- ductal visualization, however should be kept at a minimum requirements. The pancreatic calculi were fragmented in single setting and extracted using stone extraction basket. In conclusion, pancreatoscopy guided Holmium LL looks feasible for patients having dilated duct with multiple calculi for single session ductal clearance. Figure 1. A, CT image showing large calculi in the pancreatic head region. B, Fluoroscopy image showing large dense calculi in head region, spyglass pancreatoscope positioned in the PD. C, Holmium laser lithotripsy being done. D, Endoscopic image of extracted pancreatic calculi. Endoscopic treatment for chronic calcific pancreatitis has now become an established mode of minimal invasive treatment for a select subset of patients. It essentially aims at decompression of the obstructed pancreatic duct. Success of endoscopic interventions depends upon the patho-morphology and cause of obstruction; i.e. number of stones, consistency of the stones (radio-opaque or radiolucent), location of the stones and presence or absence of associated pancreatic ductal strictures. Pancreatic duct stones are usually radio-opaque, hard, spiculed as well as impacted and thus need pulverization prior to an attempt at endoscopic extraction. Lithotripsies in the form of extracorporeal shock wave lithotripsy (ESWL) or intracorporeal using electrohydraulic lithotripsy (EHL) or laser are available treatment modalities. ESWL is an excellent option to pulverize the pancreatic stones irrespective of its location in the head, body, or tail of the pancreas. As stones are pulverized to < 3mms in size during ESWL, these flow out of the duct despite the presence of ductal stricture. However, our case would have required multiple sessions of ESWL in view of the large size of the stones followed by ERCP for clearance of the pulverized calculi. As the patient had already underwent pancreatic drainage procedure in past, any form of surgical intervention would have been very invasive for the patient. Hence we subjected our patient to pancreatoscopy guided Holmium laser lithotripsy. All the stones could be pulverized into small fragments which could easily be extracted using stone extraction basket. Our case highlights that minimal invasive single session endoscopic management of large pancreatic ductal calculi is feasible and should be attempted in a select group of patients. Pancreatoscopy-guided intracorporeal lithotripsy is feasible in patients having dilated PD irrespective of the size of the stones. Stones located within the proximal PD would be most ideally being suited for this treatment to begin within. Having previous exposure to cholangioscopy guided biliary interventions can be of great help prior to attempting pancreatoscopy guided interventions especially in scope stabilization within the proximal PD and bringing the stone end on prior to pulverization with the laser fiber.